Western cuisines paired with wine? That is so run-of-the-mill! 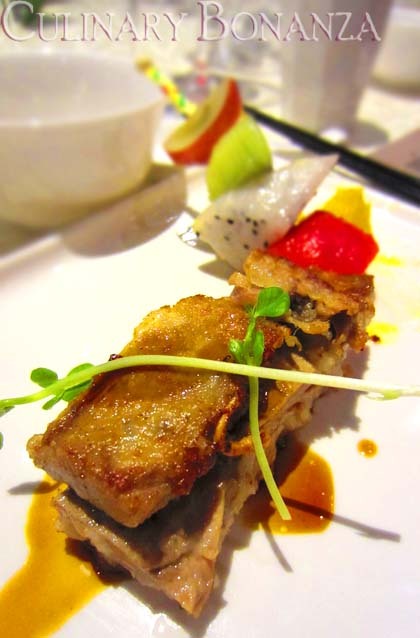 What about Chinese cuisines, paired with red, rose & white wine of varying vintages? I'd say Fascinating! Ming is a 16-years-old concept from Singapore’s reputable Tung Lok Group which packs an army of more than 35 restaurants in Singapore, China, India, Japan and Indonesia. After relocating from its old location at Setiabudi Building, Ming today reincarnates to Ming Dine Dine and Chill, which offers delectable & carefully prepared Cantonese, Sichuan and Hunan specialty dishes. But here’s the catch, this is not just a classy Chinese restaurant, it is also a place to chill over fine wine selections, cocktails and beers. The spacious rectangular bar near the entrance is an interesting addition that is not normally seen in Chinese restaurants. The hint of luxury at Ming Dine and Chill didn’t only come from the intricate chandelier specially designed for Ming by Indonesia’s famous accessories designer. The interior itself is carefully designed with chic semi-circular sofas around big dining tables, cozy lounge sofas for more relaxed setting (to chill) and 8 VIP rooms, 3 of which are equipped with state-of-the-art KTV systems. And of course, it won’t be a Chinese restaurant if there aren’t aquariums carrying live exotic sea creatures, readily transformed into luscious dishes upon your wish. At the grand-opening dinner party of Ming Dine and Chill, I spotted one of the sons of Bakrie family who recently just had a newborn. Surely this place packs plenty of punch in its mono-syllabled name, Ming, to attract high-flyers like him. Or is it simply Tung Lok’s irrefutable reputation for serving fine Chinese cuisines? The menu line up for the dinner was carefully picked and paired with equally tantalizing wine choices, courtesy of Dimatique International spearheaded by Yohan Handoyo, as the wine supplier. The result? A gratifying 6-course meal served in 1,5 hours. The first wine selected for pairing was Poderi Boscarelli de Ferrari 2009. The staff poured an intense crimson liquid into one of the 3 wine glasses arranged on the table before me. So, like a wine connoisseur, I twirled my glass clockwise with the flick of my wrist and inhaled deeply. As I took my first sip it tasted…like wine! (*duhhh). Pardon me, will you? To be brutally honest, I am not experienced in wine, but I am learning (is anybody keen to tutor me in Wine 101?). Nevertheless, I did my homework and searched for information from reliable sources, Poderi Boscarelli de Ferrari 2009 is supposed to be velvety and full bodied, with mature fruity hint, spicy with vanilla and liquorice aromas and it goes well with red meat and game, hence the pairing with Ming’s Pan-fried Boneless Duck with Shredded Yam served with Momotaro. The shredded yam is laid at the base of the tender fried boneless duck. It was the most pleasurable experience of eating duck I’ve ever encountered. 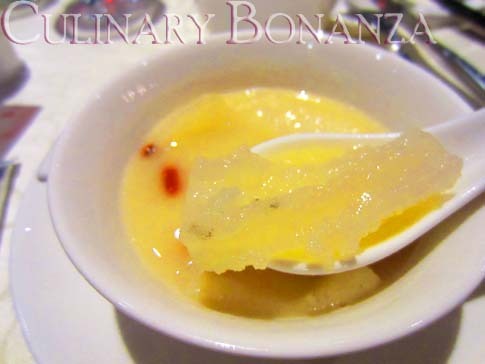 After the duck, we were each served a bowl of Traditional-style Chicken Soup with Yellow Fish Maw & Bamboo Fungus. If you look at the photo above, the chicken soup was very thick, it become cloudy, almost milky and tasted slighty gelationus. The Boscarelli wine was supposed to be saved for another dish that would come much later on, the Aloe Vera Lace Noodles with Fresh Scallops in Homemade Sauce. The aloe vera lace noodles looked rather peculiar, the wide white strands are reminiscent of sea kelps, wavy and thin at the edges, slightly thick in the centre. 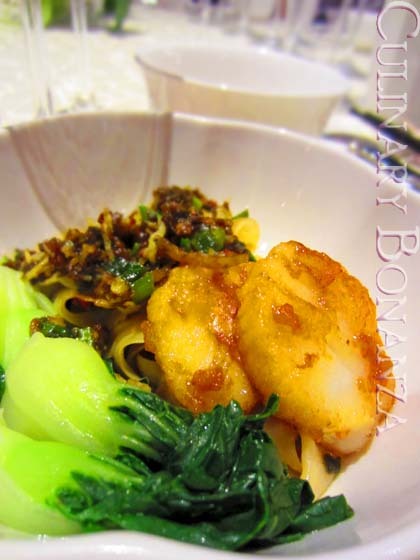 The pan-seared and marinated scallops saved the noodles, which would otherwise be boring. 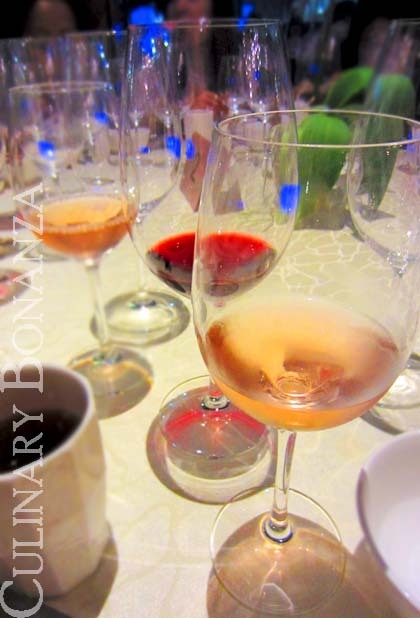 The second wine is Cape Discovery Rosé 2011, a mildly pink wine which had a fresh scent and tasted rather sweet. This zingy and sweet smelling wine was paired with Steamed Fish with Crispy Fish Scale served with Nyonya Sauce. 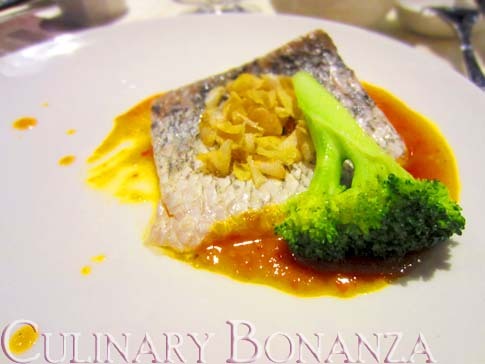 I truly loved the Nyonya Sauce, which was very tasty and goes well with the tender steamed fish. Somehow the crispy fish scales didn’t impress me much, despite its perfect crunchiness. 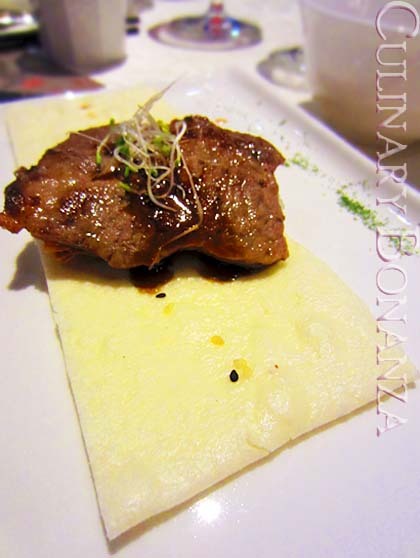 The third wine, a deep ruby Vina Ventisquero Vertice 2007 was paired with Australian Wagyu Beef served with Pancake. This was the highlight of the whole meal! 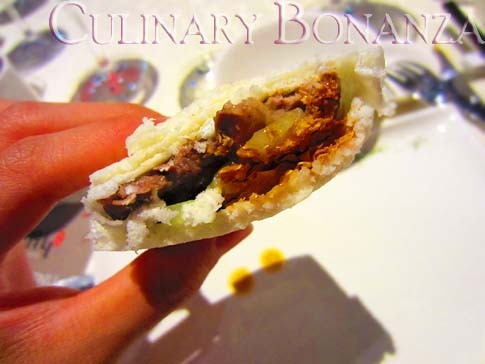 The pancake is used to wrap the finely stacked beef and other condiments underneath. At the first bite, I was hit by the surprise of biting into something crunchy and sweet, something we don't normally expect when eating steak. What made it crunchy? It's a slice of paper thin fried bean curd! I love the unexpected twists in this fine dish! Makes eating it, such a pleasurable & surprising experience. 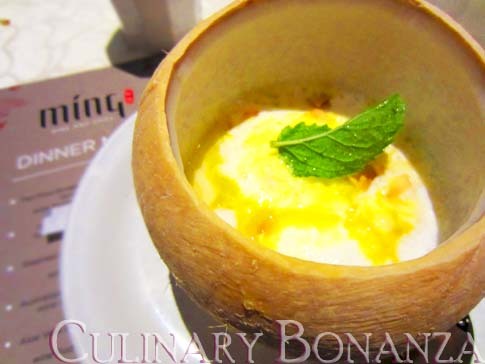 And finally for dessert, we had Chilled Mango Cream with Ice Cream served in Coconut shell. I have to say that the dessert was such a taste bud spoiler, in a good way of course! The luscious vanilla ice cream and the mango cream was an irresistible combo. I greedily scraped the tender & juicy coconut flesh off the shell and ate them with the mixture of mango and vanilla ice cream. That got my tongue dancing in my mouth! So, if you’re planning for a business lunch, treating your overseas VIPs over dinner and a karaoke session, a casual family dim sum on the weekends, or simply unwind and chill after office, Ming Dine and Chill could be an option for any of your occasions.